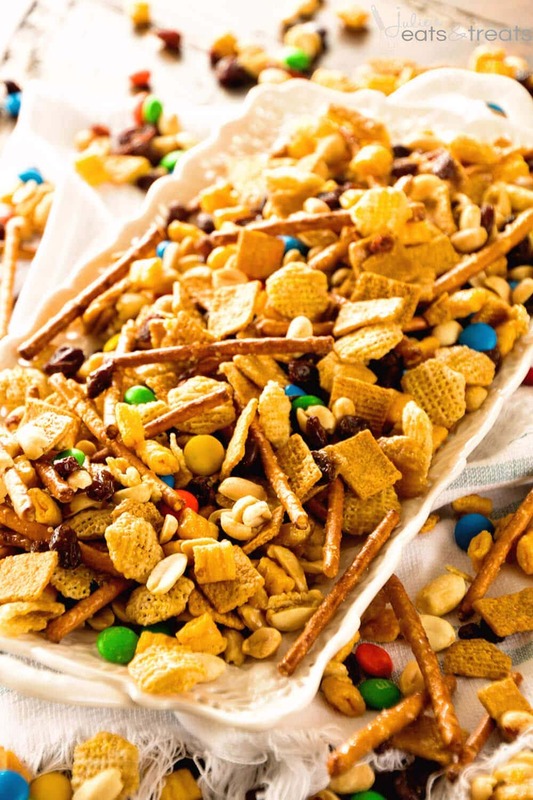 Caramel Chex Mix ~ The Perfect Blend of Sweet & Salty in this Snack Mix! Plus it’s Perfect for Parties! Loaded with Chex, Peanuts, Pretzels and Coated in a Caramel! We had our first Christmas of the season yesterday! That was number one out of six for the record. I sometimes whine about it and how much work it is to get to all the places, pack the kids up, make sure you have the right presents and the food made. It’s exhausting to be honest, but it’s so great to see cousins that live far away and I only see once every year if I’m lucky. We live in the same town our parents live in and therefore the majority of our relatives are very close to us and we regularly see, but there are still a few that don’t live close and it’s special to see them! My cousin and I were moaning over all the Christmases we needed to attend as we both have a gaggle of small children. As we were doing this my Aunt stopped and looked at us, informed us that this is her last Christmas and then slightly glared at us. We both looked at each other and said, well that doesn’t sound like fun either so we better shut up, huh? Don’t get me wrong, I’m so very thankful of all the family we have, sometimes, it’s just a bit overwhelming! Ooohhhhh, do you guys do grabs at your Christmases? We do at some of them and this was one of them! This year we had to go to the grocery store, spend $10 and find products that started with the same letter as the first letter in our first name. It was so much fun! We actually had some pretty intense stealing going on which is always entertaining. I find it amusing that my cousins know me so well. As I went in search of a present one of them shouted across the room, “Get Uncle Roy’s present!! !” Low and behold it was clear vanilla which is perfect for frosting recipes. They look out for me and this blog! After the gift grab we pulled out all the treats and wow, oh wow does my family know how to do it! Tons of cookie trays, snack mix and goodies! It may, just may be my favorite part of the day. Who’s with me on that one? 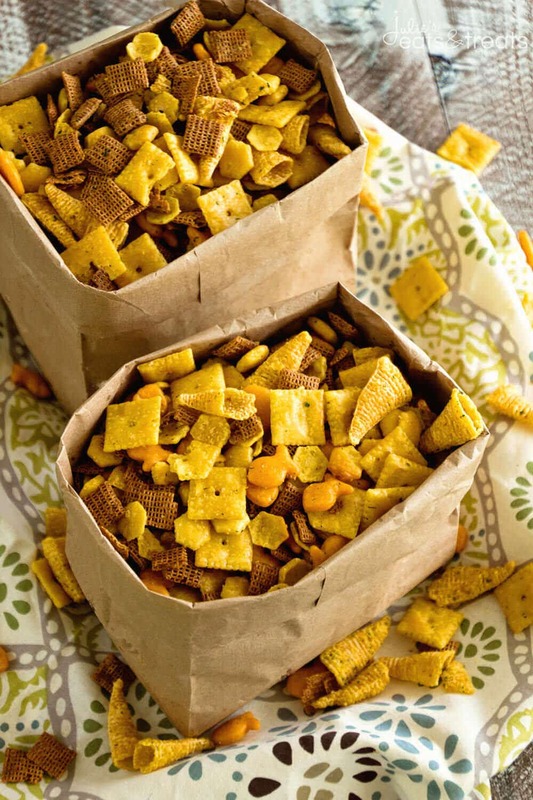 If you are looking for a new snack mix to try I’m bringing it to you today. It’s sweet and salty which is obviously like the perfect combo ever! 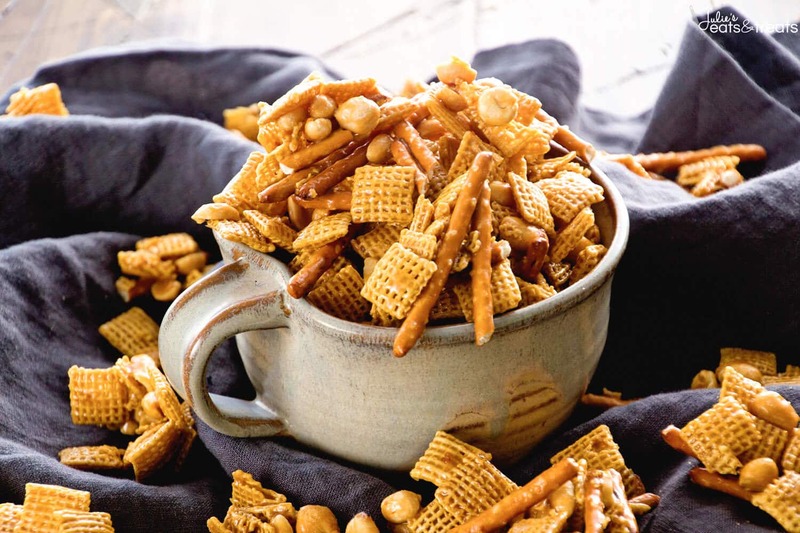 The Perfect Blend of Sweet & Salty in this Snack Mix! Plus it's Perfect for Parties! 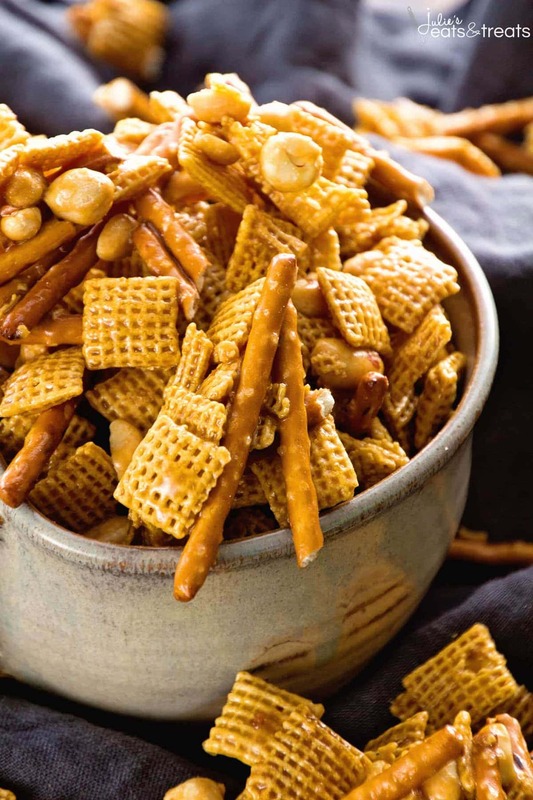 Loaded with Chex, Peanuts, Pretzels and Coated in a Caramel! Layout wax paper on counter, spray with non-stick cooking spray. 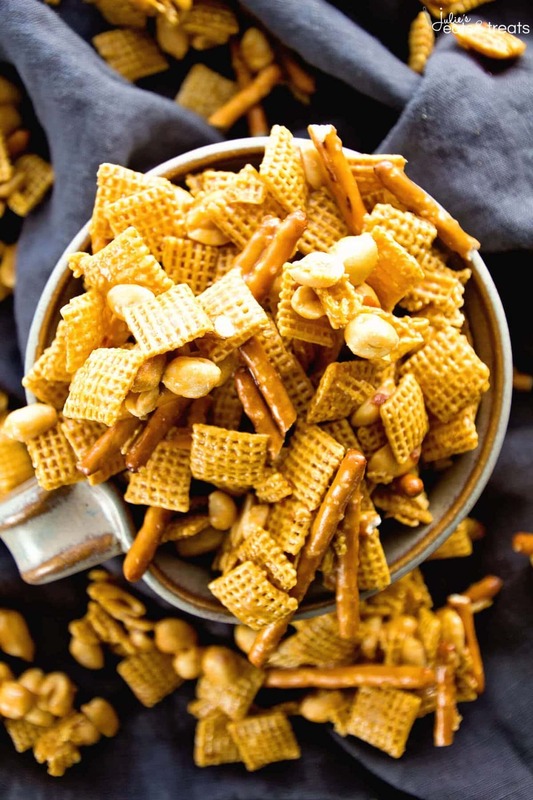 In a brown grocery bag mix together Chex cereal, peanuts and pretzels.You can double bag this if you desire. 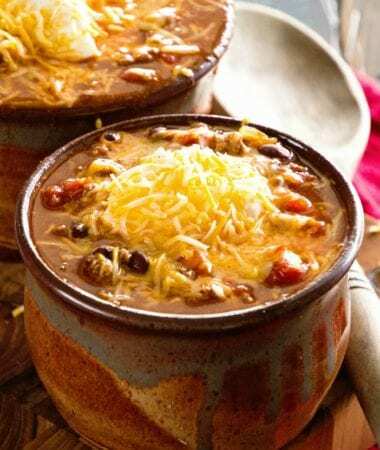 In a medium sized saucepan mix together brown sugar, salt, butter and light corn syrup. Bring to a boil for two minutes. Add baking soda and stir. Pour syrup mixture over dry ingredients. Fold down top of paper bag and place bag in microwave. Microwave for 1 minute, shake bag. Repeat for a total of four times or four minutes. Spread mixture on prepared wax paper and let cool. Break apart when cool. Get Some More Snack Mix! 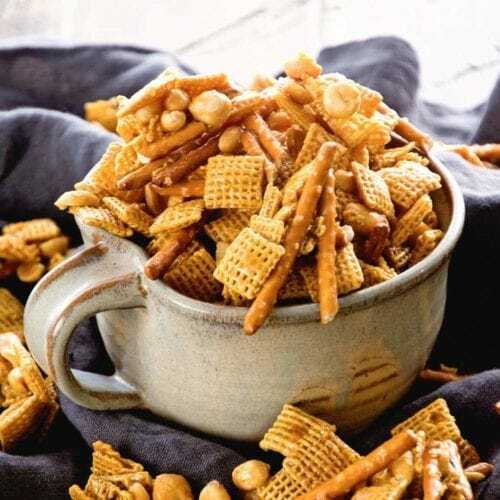 Ranch Snack Mix ~ Delicious, Easy, Homemade Snack Mix Loaded with Chex, Bugles, Goldfish and Oyster Crackers then Seasoned with Ranch Dressing Mix! Snack Mix ~ This Snack Mix is like CRACK! So Addictive and Delicious! Full of Cereal, Pretzels, Peanuts, M&Ms and Raisins! Perfect for Christmas and Holiday Parties! This really looks great and you had me at the word “caramel”! Can this be done in the oven? I’d like to make several batches for gifts, and don’t want to be standing all day in front of the microwave! I too would like to know if it can be done in the oven, this looks delicious by the way!! Barb, I haven’t made it any other way and all my “caramel” based snack mixes use a microwave method. Let me know if you try it in the oven. Jenny, I haven’t made it any other way and all my “caramel” based snack mixes use a microwave method. Let me know if you try it in the oven. 1/2 tsp! Sorry. It’s updated. Thank you for alerting me!